Caroline has taken a clear and consistent stand for peace, justice and equality. She's standing up for a safer world. Tony Blair’s illegal and catastrophic invasion of Iraq. David Cameron’s military intervention in Libya. Selling arms to brutal regimes like Saudi Arabia and Qatar. The foreign policy of this government and Labour before it has been counterproductive, hypocritical and made the world a more dangerous place. It has helped to radicalise increasing numbers of young British people, made terrorist attacks more likely at home and inflamed violence overseas. Caroline has taken a clear and consistent stand for peace. She has championed a new foreign policy doctrine based on diplomacy and clear principles, consistently applied. This should not include selling arms to brutal regimes like Saudi Arabia and Qatar. It should not include tolerating war crimes in Palestine. “We must stand up for international law,” says Caroline. She strongly condemns the brutality of terrorist groups like ISIS and voted against military action in Iraq and Syria. She remains unconvinced it will do anything to ease the crisis in the Middle East. Rather, it will add to the number of civilian casualties and create recruits for ISIS. Caroline opposed the 2003 invasion of Iraq. As an MP she secured a debate to mark the 10th anniversary of what she describes as "an unprovoked and illegal attack with dire consequences that are still being felt today". She is calling for full publication of the Blair-Bush Iraq talks to help shed light on how approval for the war was granted by Parliament and has urged the swift publication of the long delayed Chilcott report. As a passionate campaigner for justice and equality, Caroline has called for international human rights laws to be upheld. In particular she has demanded an end to the occupation of Palestine, calling on both Israel and Palestine to end the violence and fully respect human rights. She has spoken out about breaches of human rights in West Papua, Burma, China, Tibet, Iran and many other places too. Caroline has proposed a number of early day motions calling on the Government to end the promotion and export of military equipment to all authoritarian regimes. 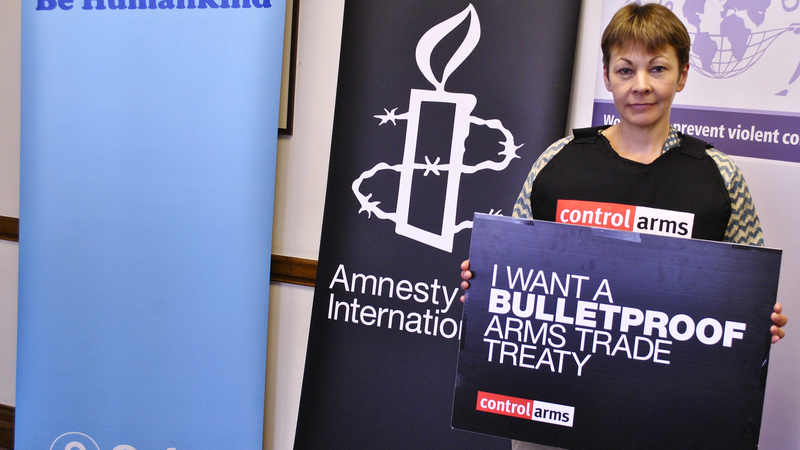 She has been to the DSEI arms fair, where she exposed the sale of illegal cluster munitions. On another occasion she secured the expulsion of two exhibitors from DSEI after telling Parliament that she had evidence of the promotion of weapons of torture. Caroline is Chair of Parliamentary CND. As it tells us to tighten our belts, this government plans to commit over £100 billion on replacing Trident with a new generation of nuclear weapons. Such weapons do nothing to combat the threats posed by terrorism, climate change or cyber warfare. They will not make us safer, but they will make us poorer. There are much more worthwhile ways to spend over £100 billion. The government has pushed through Trident, a position which Labour supports, and boycotted internation disarmament talks. Caroline is part of the Rethink Trident campaign. She will fight this astronomic and unjustified investment in Trident every step of the way. There are now more displaced refugees in the world than at any other time since the Second World War. Syria is the scene of the worst humanitarian disaster in the world, civilian casualties and displacement are mounting again in Iraq, and the siege on Gaza has been described as “collective punishment”. Caroline has consistently emphasised the need for a foreign policy that prioritises helping those suffering as a result of humanitarian crises. Caroline’s previous role at Oxfam gave her direct insight into the importance of international development work. She voted for the UK’s commitment to overseas spending to be enshrined in law and champions the Millennium Development Goals to help lift people out of poverty. Women need to be at the heart of development, so Caroline joined the One Billion Rising global campaign for women’s rights and has been an effective campaigner to end violence against women and girls worldwide. She has used International Women’s Day and International Human Rights Day to raise the issue of women’s equality in Afghanistan. Caroline has also actively lent her backing to campaigns for Fairtrade, for access to clean water, better maternal healthcare, and microcredit. During Prime Minister’s Questions, she asked the Prime Minister to back an international Robin Hood Tax – a small levy on financial transactions. Caroline wants to see the money raised used to advance economic justice across the world. Our changing climate will put over 200 million people at risk of hunger worldwide over the next 20 years, so Caroline has challenged Ministers to ensure all development aid is climate friendly and has demanded radical action to prevent global climate change. Working with a whistle blower in her constituency, Caroline exposed serious shortcomings and maladministration in the Department for International Development’s oversight of its overseas investment programmes. She argues that every penny of tax payers’ money used for international development must help prevent or alleviate poverty and associated problems. She used her very first speech in Parliament to explain why companies operating abroad should adhere to strict environmental and human rights standards.